I’m currently working on a story for performance at Story Arts of Minnesota’s quarterly PROMPT series. These stories are “based on, inspired by, or tangentially related to classic work.” As I mentioned in my last post, the classic work for our show on September 6 is Homer’s Odyssey; the theme, “Getting Back.” I am telling with two established storytellers, Larry Johnson and Nancy Donoval, and with Alex Cleberg, one of SAM’s Joan Calof Emerging Artist Storytelling Fellows. Working with a story someone else created (in this case, perhaps several someones) is different, obviously, from telling a personal story, though you bring your personal experience to it, and the resulting interpretation is unique. For my personal stories, with the exploratory exercise I use from Lynda Barry’s What It Is, I can get most of the details from my head, though I sometimes need to do research to fill in gaps in my memory. For this story to have the vivid details I want it to have, I’ve had to rely a lot more on research. My own story centers on Penelope, wife of Odysseus, and tells the tale of that return from her point of view. That’s a bit of a trick. Even though scholars as far back as Samuel Butler in 1897 have claimed the Odyssey was written by a woman, based in part on how comparatively well detailed the scenes of women’s daily life are, there is really not that much to go on. For the scene in which Penelope unravels her weaving at night, for example, I have had to get a better sense of what the room she was in would have been like. It’s not an exact science. From the British Museum I learned that the women’s quarters in a typical Greek home, the gynaikon, where Penelope set up her loom, would likely have been upstairs, in an inner portion of the house, secluded from outsiders. But the only specific discussion of the layout of the palace of Odysseus I’ve found goes into great detail to assert that the women’s quarters was actually closer to the great hall, the megaron, and more accessible. There is a terrible irony in the fact that one of the scholars who helped establish this theory, published in the American Archaeological Review in 1919, left his work incomplete, as he himself “fell in 1916 in the first Somme offensive.” Men keep going off to war. Even those that have studied the wily Odysseus do not always come back. For one thing, women would have been protected from the prying eyes of these fervid Pre-Raphaelite suitors. For another, the loom is completely wrong. It would have been a warp weighted loom, and Penelope would not have been seated at it. She would have passed the weft between the warp threads and rammed it in place with a pin beater. The loom would have been tall, and she would have walked back and forth, back and forth, on platform shoes if necessary, rolling the work upward as it was completed. 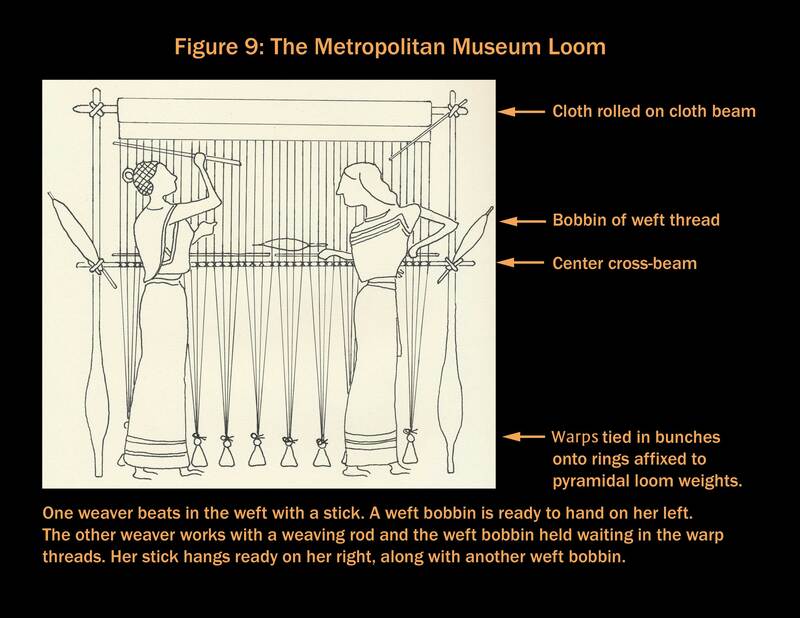 From Susan T Edmunds, Picturing Homeric Weaving. 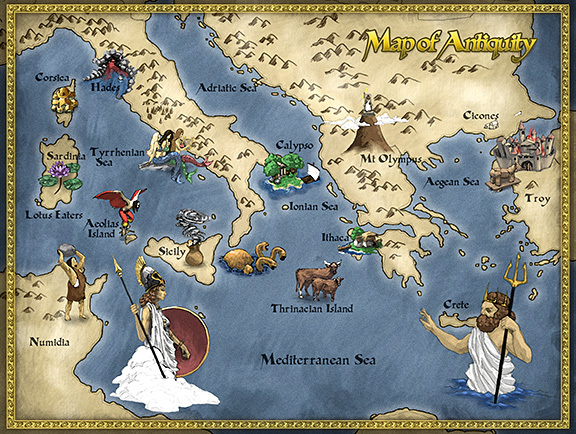 Courtesy the Center for Hellenic Studies. 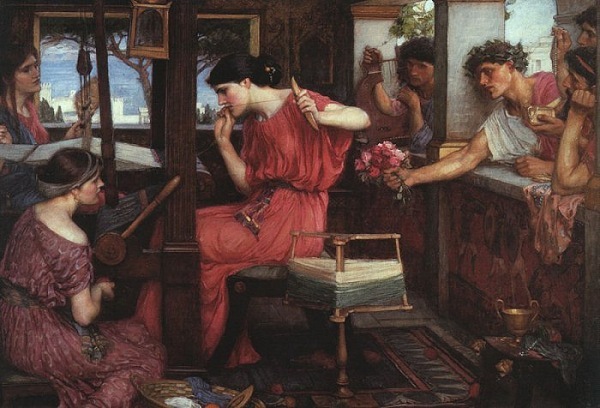 By the time three years of weaving and unweaving had passed it is likely Penelope could have walked to Troy and back herself. A shroud to honor Odysseus’ father Laertes would most likely have been pattern weave, with stories commemorating his heroism – or his son’s – depicted in the cloth. So the shroud of Laertes, and the work Penelope does on it by day that is unravelled each night, becomes itself an unspoken narrative within the Odyssey itself, the unexpressed feminine perspective on the many ways of men. A simple question like Barry’s “What season is it in your story?” is not always easy to answer either. Listening to John Lee’s reading of Samuel Butler’s translation of the Odyssey, I picked up nothing about the seasons. 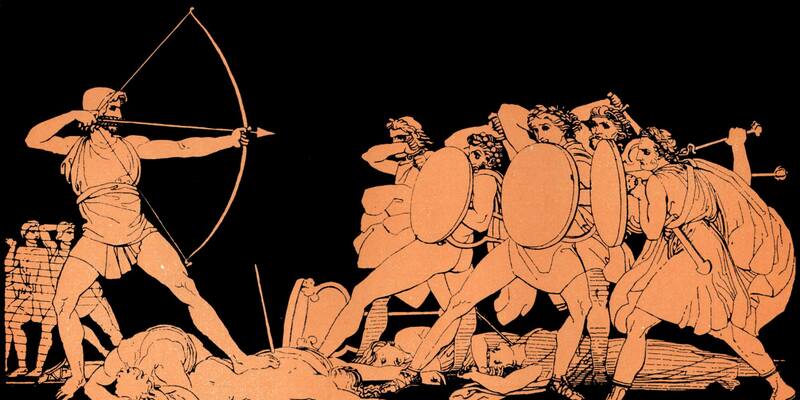 Other people, however, have studied the text more carefully than I have, and are able to date Odysseus’ purported return “to April 16, 1178 B.C., close to noon local time.” (It helps to have a solar eclipse in the mix.) Still, the scene in which Penelope is discovered unravelling the shroud happens at some unspecified time before Telemachus takes his sea voyage, nowhere near Odysseus’ return, so we’re back to square one there. Conjuring up what other objects would be in the room is relatively easy: museums are full of these things. The loom itself. The kalathos, a woven basket for the wool thread. The warp weigts. A wooden spindle. But figuring out what sounds and smells would have come Penelope’s way is much harder – largely because I haven’t been able to figure out whether the women’s quarters would have had any kind of windows through which the outside could get in. The narrative does make it clear that Penelope could hear Telemachus sneeze in the Great Hall from her quarters. So I suppose the sound of insects at night, or birds at dawn, would have penetrated as well. How old is Penelope when this takes place? Margaret Atwood, who has written an entire Penelopiad, pegs her at 35 or 36, based, I think, on the fact that young girls were typically married off at about fifteen. Atwood’s novel has itself become theater, as you can see in the trailer above. I’ve read the book, but have not seen the play. I think that’s for the best. It would make it just too hard for me to chart my own course home. Lovely post, Paula, I admire your dedication to research. The Margaret Atwood novella came immediately to mind when I began reading your post, I haven’t seen the show either but I did enjoy the book. I’m sure you’ll manage to put your own stamp on this story. Love reading about the research and your detective work — So interesting. I hope you’ll be able to share your performance! Glad it intrigued you enough to want to spend time on it, Kimmie. I am listening to Sir Ian McKellan reading it on Recorded Books in the evening, the Robert Fagle translation, and it’s such a pleasure to hear him bring the story alive. There’s a whole lot I didn’t know about it, and I’m not sure how much of the actual poem I actually read before; most of my mythology comes from grade school books that retold the stories. Thoroughly enjoyed this. I think Odysseus is an intriguing character and enjoyed The Odyssey’s adventures. Your details make it even richer. Thank you, Lori. That heartens me.